Abstracts may contain minor errors and formatting inconsistencies. What are Digital Object Identifers? 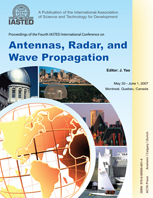 The topics of interest include, but are not limited to: Antennas and Antenna Arrays - * Smart Antennas * Micro Strip Antennas * Antenna-coupled Infrared Detectors * Micro Machined Monolithic Antennas * Phased-array Antennas * Fractal Element Antennas * Reflector Antennas * Beam Scanning Capability * Photonics in Antenna Systems * MEMS Components * Modelling * Performance Evaluation; Radar - * SAR / ISAR * Chaotic Signal Radar * MTI Radar * STAP * Super-Resolution Algorithms * Multiple Hypothesis Tracking * Beam Forming * Detection and Target ID Algorithms * Signal Processing * Radar Imaging; Wave Propagation - * Satellite Propagation * Atmospheric Propagation * Indoor and Urban Propagation * Audio Propagation in Cellular Networks * Scattering, Diffraction, and Diversity * Wave Penetration * Bio-Electromagnetics; Materials and Structures - * Microwave Materials * Electromagnetic Properties of Materials * Metamaterials * Periodic Structures * Band-Gap Structures * FSS * RF-MEMS * Waveguides * RF Circuit Components; Microwave Metrology - * Instruments and Techniques for Measuring Impedance * Noise * Power * Time * Frequency * Voltage * Current * Scattering Parameters * Biological Effects; Computational Electromagnetics - * Propagation Modelling * Scattering and Inverse Scattering Problems * CAD * Channel Modelling * Meshing Strategy * Multipole Methods * Method of Moments * Wavelet-based Methods * Finite Element Analysis.